I went to El Pulgarcito Restaurant in Scarborough this past Saturday with a Filipino friend who had heard a lot about pupusas but had yet to try them. Finding El Pulgarcito was a lot harder than we expected. We drove down Kennedy with our eyes peeled, but couldn’t find the place we were sure we had both seen. In its place, an Indian restaurant. By the time we reached Eglinton, it occurred to me to use some food apps on my iPhone to find it. I was eventually able to find a number for El Pulgarcito so I called the number to see if it was still open and confirmed their address. "2260 Gooseman" or "2260 Dorseman" was the best I could make out, but they said it was just south of Sheppard, so I figured I could search the map for a small side-street near Sheppard & Kennedy with a similar sounding name. We headed back up Kennedy but I couldn’t find it on the map so I called again and asked them to spell the address – "2260 B - i - r - c - h - m - o - u - n - t" he said, half in English letters, half in Spanish. His pronunciation of Birchmount was with a super-heavy accent so that’s why I couldn’t make it out. "Veer-sh-mun!" It turns out, they recently moved from their old address at Kennedy & Lawrence to this new location at Birchmount & Sheppard. Once we finally got there, we found El Pulgarcito in a small strip mall. Nothing fancy, but definitely not a "hole-in-the-wall" establishment either, you could say it looked like a typical ma-and-pa type of restaurant. The restaurant, which was empty when we arrived, appeared clean and well-kept. We were invited to seat ourselves wherever we liked while our waiter (who it turns out, was also the owner) grabbed us some menus. The menu was small enough that everything can always be served fresh, but large enough and with enough variety to encourage repeat visits. Apart from the staple traditional menu items (Sopa de res, Sopa de patas, Desayuno Salvadoreño, Tamales, Yuca Frita, Pupusas, Tamales, Pescado Frito, etc.) they also had nachos, tacos, quesadillas and other Mexican-influenced dishes. Contrary to what you’d expect, their menu was very well-designed and laid out – a very nice-looking, above-average menu. I did notice a spelling mistake – "Quezadilla" instead of "Quesadilla" and the font-size on one of the menu items was smaller half-way though the description, but overall it was a very well done menu. With a prominent backdrop of wheezing gasps for air as our waiter breathed heavily over our table, we ordered two chicken tamales (one each), three cheese & loroco pupusas, three chicharron pupusas and three revueltas or mixed/everything pupusas. Though they do have beer on the menu and a fully-stocked bar in the front, we had to settle on horchata since they hadn’t received their new liquor license yet. I was quite shocked to see the horchata ($2) arrive in disposable plastic cups – not at all what you expect from a sit-down restaurant, no matter how informal. But the horchata was freshly made, not too sweet, not too thick, not too runny and most notably, not too much ice. In a proper glass, it would have been superb! After what seemed like half an eternity, the tamales ($3) were next to arrive. Smaller than average, I immediately noticed that the tamales were microwaved and tasted old. If they were just re-heating the tamales in a microwave, then what were we waiting so long for? Even if I don’t compare these tamales to my mom’s famous tamales, (which would be a hard standard to live up to for most anyone), they still left a lot to be desired and were very below-average. The texture of the masa was too grainy in some parts, dry and not velvety smooth like it should be. I noticed some white sesame seeds that were still whole – obviously they weren’t toasted long enough nor blended properly. The tomato sauce was uncharacteristically sweet and not what you expect in a tamale – it was almost like it was Italian tomato sauce (with basil), but with sugar added. Weird. And though the potato wedge was quite large, they were very skimpy with the rest of the ingredients. Inside, just one olive and a minuscule shred of dry chicken that tasted like it was boiled in plain water without any salt. 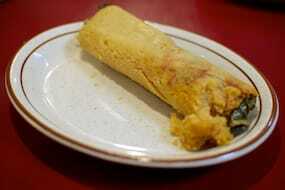 The banana leaf accompanying both tamales was also very small, too small to allow the tamale to actually be wrapped in it, so the masa was unable to absorb any of its scent or flavor. Overall, a very weak attempt at a tamale. What a shame. Another half-eternity later, the pupusas arrived looking like quite a messy disaster. These were easily the worst-looking pupusas I’ve ever seen. Split and torn along the edges, dry and overcooked in parts, almost more cheese on the outside than on the inside, barely round and all different sizes. Even Michelle (my Peruvian-Canadian wife) made better-looking pupusas on her first attempt without my mom’s assistance. If these pupusas came out super-fast, though it still would have been inexcusable it would have at least been explainable, but to take so long only to arrive at this embarrassing result? Very sad. The cheese pupusa ($2.50) was the first I tried and I was immediately put off by the overpowering feta in the mozzarella/feta cheese mixture. And if that wasn’t bad enough, the cheese had a very chewy and dry texture (I could tell they hadn’t added any cream), not to mention that they were very skimpy with the loroco. These were, undoubtedly, the worst of the three pupusas. 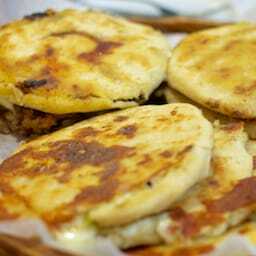 The revueltas/mixed pupusas ($2.25) were just OK with the chicharron pupusas ($2.25) by far the best of the lot. I could taste that they left the pork skins on when grinding the chicharron (yum!) and they were swimming in grease as a result, but the chicharron was surprisingly very well made and packed with flavor. 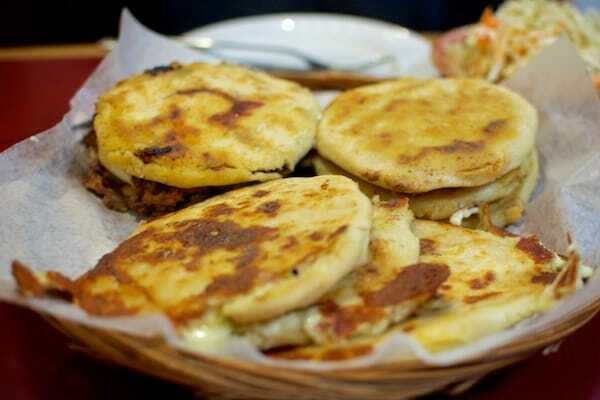 I don’t mind super greasy pupusas if they taste good, and these ones weren’t too bad. If I can be picky, I’d say the chicharron was a little too pale-looking (for my liking), but given everything else that was wrong, it was quite easy to forgive. To their credit, the curtido and tomato sauce came in very generous portions – more than enough to accompany our nine pupusas. Unfortunately, however, the curtido was bland and very pale looking. And the plastic jar that held the tomato sauce leaked profusely as we poured it, making it almost impossible to get any sauce on our pupusas. Messy as hell. While it was still an edible meal and not at all disgusting, the food at El Pulgarcito was very below what you can expect at similar Salvadoran restaurants in Toronto, like Mi Pueblo Restaurante as just one example. The service, obviously, didn’t make up for the kitchen’s shortcomings either. However hard to listen to, I can excuse our server’s wheezing deep breaths if it’s a medical issue, but that’s hardly the worst of their problems. Our waiter seemed to be trying to get by with just the minimum amount of effort, (keep in mind the place was empty when we got there), to the point of being very inattentive. After our pupusas arrived, the curtido and tomato sauce followed immediately after, but without a serving fork. After waiting a couple minutes for our waiter to come by our table, I had to get up and walk to the kitchen myself to see about getting us a fork so we could start eating. Also, if our waiter was more attentive, we probably would have said something about our tomato sauce leaking and could have had a more enjoyable experience. The experience we had at El Pulgarcito was not abysmal by any means (in good company all is swell) but there was nothing about it to inspire me to return. I’m more likely to jump on the 401 and trek out to one of Toronto’s other Salvadoran restaurants (there are many) before going back to El Pulgarcito, even if it means making an extra 25 minute drive all the way to Mi Pueblo Restaurante in the west end. Close enough. I’m looking forward to taking my friend out for pupusas and tamales again so he can see what they’re really supposed to taste like, but given this experience, I’ll understand if he’s not so gung-ho about the idea. it’s unfortunate. El Pulgarcito was published on Wednesday, November 6, 2013 at 10:47pm EST by Daniel Menjívar and last updated on April 11, 2018 at 9:30pm UTC .